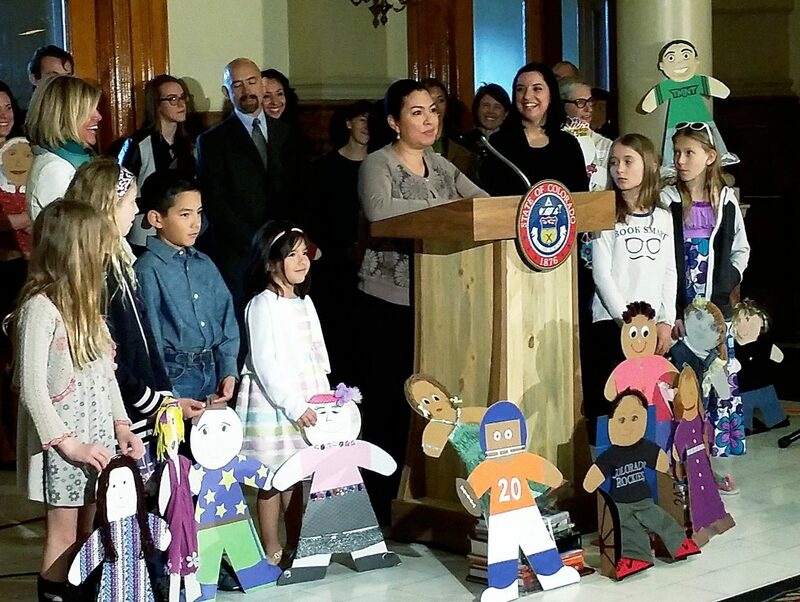 DENVER — The Carbondale-based Valley Settlement Project was hailed Monday as a success story for helping families be part of their schools and communities as advocates rolled out Colorado’s annual Kids Count report. Valley Settlement Project “is a model of the kinds of innovation and commitment that is making a difference across our state,” Lt. Gov. Joe Garcia said at a news conference on the report, which assesses children’s well-being. Alejandra Magaña, now head of the project’s lifelong learning effort, offered a powerful example of how the program changes lives. “Two years ago, I didn’t speak English,” she said, following the lieutenant governor in addressing a group of about 75 in the Capitol as her children looked on. “Somebody told me about the Busesito program,” a bus that takes preschool programs to poor, immigrant neighborhoods. That got her out of the house. Then she became a parent mentor for a third-grade class at Crystal River Elementary School in Carbondale. “Now I feel confident, and now I feel I belong to the community,” she said. The Valley Settlement Project, shaped by 300 home visits and outreach to 60 organizations, takes a two-generation approach, empowering both immigrant parents and children through early childhood programs and involvement in Roaring Fork School District classrooms. It also has spawned adult education programs for the parents. The settlement project was included in the 2015 Kids Count report, Watney said, because “we pick stories that show a community taking on an issue that we hope will be inspiring to people around the state” and be replicated. The larger Kids Count report, issued in all 50 states annually with support of the Baltimore-based Annie E. Casey Foundation, provides a trove of data, policy recommendations and real-world examples meant to improve the lot of children at risk of poor educational, economic, social and health outcomes. The 2015 Colorado report shows that child poverty in the state has declined for the first time since 2008. Watney said the decline was slight, from 18 percent in 2012 to 17 percent in 2013, the latest year for which data is available. But that 1 percent drop means 17,000 families were better able to provide for their children, she said. That progress is important in part because Colorado’s child population is growing at the eighth-fastest rate in the nation, rising 12 percent since 2000. The report said that progress against poverty was uneven, with many rural areas still experiencing high levels of child poverty, at 23 percent — poverty defined as annual income of $23,550 for a family of four. The rural child poverty rate is up from 20 percent at the start of the recession in 2007 and higher than the statewide average of 17 percent. “The recovery hasn’t really hit our rural and outstate communities,” Watney said. Garfield County did better than the state as a whole, with 16 percent of children in poverty here. The report provided rankings in several areas for the state’s 25 most populous counties, with Garfield ranking 14th among the 25 in the Colorado Child Well-Being Index. Sarah Hughes, research director for the Children’s Campaign, said Garfield County’s strong points in the report included the third-lowest percentage of teens age 16-19 not in school and not working (just 3 percent); and the fifth-lowest percentage among the 25 large counties of children in single-parent households (21 percent). On the other side of the coin, Garfield was 23rd worst of 25 in the percent of fourth-graders reading below grade level (39 percent); 22nd worst in uninsured children (18 percent, double the state rate); and 22nd worst in its teen birth rate. The latter, though, has declined from 73 births per 1,000 teen girls in 2000 to 39 in 2013. That’s still well above the state rate of 22.3 births per 1,000, which has fallen dramatically in recent years. The Roaring Fork Valley, because of the recognition of the Valley Settlement Project, was well-represented at Kids Count events Monday. Besides Magaña, Elisabet Rojas, head of the Busesito program, spoke at the news conference. She moved to the valley from Spain when her husband got a job teaching Spanish at Colorado Rocky Mountain School in Carbondale, and started teaching the settlement project’s Spanish-language GED classes. She, too, has learned English through her work with the project. In the crowd was Rob Stein, assistant superintendent and director of curriculum for RFSD. The Valley Settlement Project’s parent mentors, whose number has grown from 14 two years ago to 70 this year and are in every district elementary school, “have been great partners for us in a lot of ways,” Stein said. “It provides cultural exchange, and it’s an extra set of hands providing instructional support” and bilingual skills, he said. It even has become a source of district recruiting, with former mentors, including Magaña’s husband, Ricardo, being hired by the district as a paraprofessional.